Lay out a record home page using the Grid System. Employ two variants of the Card component to render record related lists. Thanks for sticking with the module this far! In this final unit we’re going to build another brand new page which will magically again conform to the Lightning UI without us writing a single line of CSS. We’ll be using many of the components we’ve learned about in the previous modules including the Grid System, Page Header, and Icons. We’re also going to introduce a couple of key new components, Card and Tile. The page in question is going to be a Record Home page. Why this page? We figure it’s prototypical of many of the app pages you’ll be building, in many ways it’s the classic Salesforce page. This example will be a template on which you base your apps. Also it’s complicated but not too complicated so it’ll make good practice and you’ll earn your Trailhead badge in the process! Shall we begin? Here’s a wireframe of the page we’re going for. At the top a page header, with two related lists below, a large one on the left, and a compact card to the right. Below that we have the usual footer. The good news is that we’ll be able to reuse a bunch of the markup we’ve written previously. Lets start with an outer page skeleton in a brand new Visualforce page, named Trailhead_SLDS_RecordHome. Next we’ll add a Page Header component, this one a bit more involved than the one we used in the list view. We’ll have two rows. The first one will be much the same as in the list view. The second row will show some key fields from the record. Preview your page and you will see the top row of the page header as expected. If any of the code is unclear, please refer to the previous units or the respective component documentation. Yet again, the Design System has made our life really easy. This code lays out a complex component conforming to the Lightning UI spec without typing a character of CSS. Lets step through the code for the detail row. Again, we recommend having the code open in your favorite editor besides this window so you can cross-reference. The outer <ul> instantiates our grid and adds the class slds-page-header__detail-row for correct alignment. The four fields are laid out using a series of <li> with a slds-page-header__detail-block class. Inside each detail block, we have one or multiple <p> element(s) carrying three classes: slds-text-title, slds-m-bottom_xx-small to add space below them, and slds-truncate to truncate the field value. You can see a complete record home page header example on the Page Header component page. Now let’s move onto the record home detail area where we want to have two related lists side by side. We use another Grid System component to lay our two columns sized manually using the size helper classes. The first column will contain a large related list card. The narrower right-hand column will contain a compact card. Each of these is a variant of the Card component. Now this demo just has one example contact so don’t show this to your sales people! In real life you would have loads more people to sell stuff to! Let’s step through the markup. The Card component is wrapped in a <article class="slds-card"> element. The card header is specified by a <div> element with the slds-card__header and slds-grid classes. The two columns contain a Media Object and an action button respectively. The second column could easily be extended using a Button Group component as in the list view. As always you can find more documentation and examples of all these classes on the Design System website. The Card body is a <div> element with the class slds-card__body. Inside we have a Data Table component. The Card is completed with a “View all” link inside <div class="slds-card__footer">. As before, we provide a card header and a card body. The card body is a series of Tile components. A Tile is a grouping of related information associated with a record. There are several variants of this component, each with different groupings of information. Pay close attention to the markup in the examples provided in the documentation, as each tile layout is constructed differently. Here we use the simplest base variant. Each tile has the slds-tile class. Inside that we provide a title for the Tile and some contents. As before, we wrap up the card with the same <div class="slds-card__footer"> markup we used in the other Card. This complete example of the markup for a fairly complex record home brings this Trailhead module to a close. 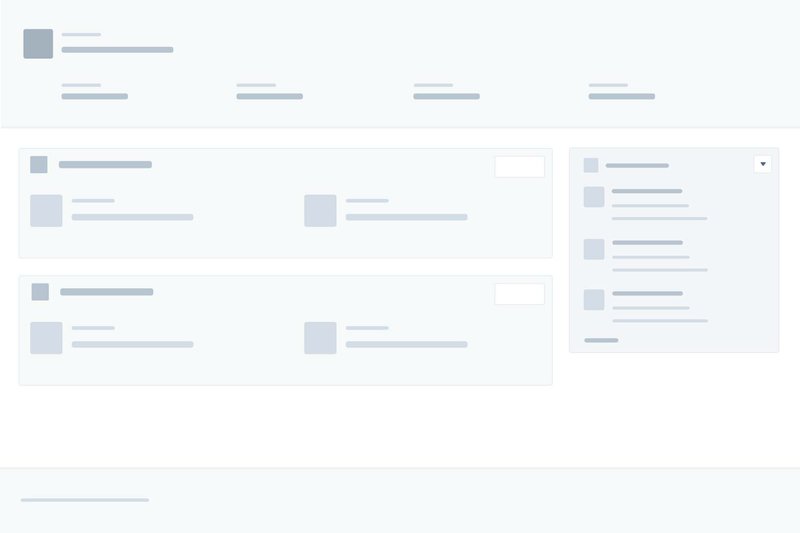 Hopefully you now have a solid foundation in the Design System and are eager to use it in your own applications. Obviously these sample pages are just the beginning. When building your own apps, your next step would be to hook in real data, link pages together, and build out your business logic. We hope the Design System will free you up from styling UI with CSS so you can focus on building out this real functionality. Have fun and please do send us feedback on how you get on.